A fighter from Michigan is aiming for a big night in Atlantic City. But it’s not the one you think. Though the April 13 card at Boardwalk Hall is headlined by two-time Olympic champ Claressa Shields and her quest to unify the women’s middleweight division, it’s unbeaten Saginaw resident Jermaine Franklin who’s planning to leave a lasting imprint on the heavyweight ranks. The 25-year-old will take on once-beaten former amateur star Rydell Booker in a 10-round co-feature that’ll serve as the middle piece of a three-bout show to be broadcast by Showtime at 9:10 p.m.
Booker, for those unaware, was himself an unbeaten prospect before dropping a 12-round decision to James Toney in a heavyweight title eliminator way back in 2004, then subsequently spent 12 years in prison after a jury convicted him on a drug charge in 2005. He’s won three straight fights, all six-round decisions, in a comeback after returning to society. Still, Franklin, who’s 17-0 with 13 KOs himself, has no intention of prolonging Booker’s streak. Instead, he views his 2019 debut – amid the premium cable hubbub – as a career-making opportunity, though he’s doing his best to downplay its significance. He’ll enter the ring as the No. 56 heavyweight in the world, according to the Independent World Boxing Rankings, which position all fighters in a given weight class regardless of titles or sanctioning body listing. That’s two ticks ahead of former WBC champ Bermane Stiverne and another four up on recently beaten challenger Gerald Washington. Booker, incidentally, is a spot ahead of Washington at No. 61. “2019 is my coming out party to the boxing world. It is a step-up year,” Franklin said. 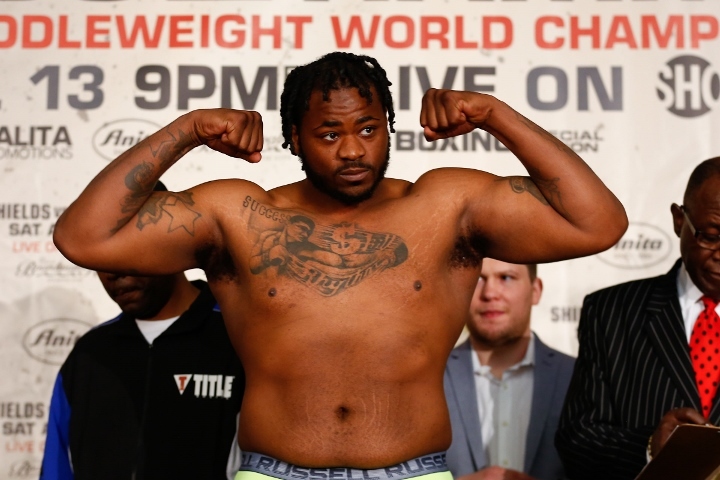 “By the end of the year, I want to be considered as a major force in the heavyweight division. I am going to show that I am the best new heavyweight in the world. America needs a new face in heavyweight boxing, and that’s me, born and bred in Michigan. His mettle has been tested out of the ring as well. He last fought in July – defeating Craig Lewis by wide decision in Detroit – but the eight months since have been challenging after a spate of tragedies cost him several close friends and confidants. Franklin’s most substantive victory came in July 2017 when he outpointed rugged Uzbekistan export Akhror Muralimov, then rated No. 64 by the IWBR, over eight rounds. Muralimov was coming off a bout with imminent title challenger Jarrell Miller and followed up with a match against Bryant Jennings. Franklin has since rattled off victories against Daniel Pasciolla, Tyrell Wright, Cory Phelps, Ed Fountain and the aforementioned Lewis – who’d arrived with a combined record of 60-16-7. They’ve since combined to go 0-5. “I want to fight the best,” he said. “I beat all the top guys in the amateurs, and as a professional from the beginning of my career I wanted to fight the best. That’s why you see several undefeated fighters on my resume and so-called gatekeepers that other prospects didn’t want to touch. I'm coming for everyone. He considers Anthony Joshua the top man in the division for the time being, even labeling him “the total package,” but considers Deontay Wilder and Tyson Fury as Nos. 1A and 1B. Franklin inked a deal with Salita Promotions toward the end of 2018 and expects the alliance to pay household name dividends before too much longer. “In my mind I am the best heavyweight in the world,” he said. “I may be 6-foot-2, but my heart and skills are 8 feet tall. Not too many fighters are going to measure up to that. Boxing is about balance. I am a balanced athlete who's also strong, fast, athletic and getting fitter and better with each fight. Is this Franklin guy any good? I suppose it's ok that women are headlining an event, whereas before it would be embarrassing for the men. But Shields and Hammer are exceptional female boxers, whereas most are not good.